The history that surrounds Storsjöodjuret (The Great Lake Monster, also called Storsie outside Sweden) is long and full of interesting moments. In 1894, a local push to capture one of these animals created headlines. 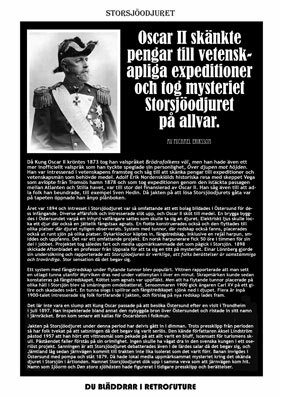 King Oscar II was interested in science and enjoyed to support expeditions and he actually put some money into the project. What happened next is quite interesting. For years, people tried in many ways to capture or kill an animal. One method was floating barrels with specially designed hunting equipment underneith. On one occation, witnesses saw a barrel disappear below the surface for about a minute. Upon investigating the equipment afterwards, they found scrapmarks in the metal, like they had been in contact with teeth. Eventually, all these barrels in the lake became a problem as accidents with local shipping started to appear. Steamer Carl XV was seriously damaged in a collision in 1899. The hunt went on for about a decade. In 1897, Oscar II visited Östersund. In 1888, a professor from Uppsala was sent to the lake to investigate (payed by newspaper Aftonbladet). He wrote a series of articles that proclaimed that, in his opinion, the animal is real. Hunting equipment from the day can still be seen at a local museum called Jamtli, but people have largely forgotten all about it. It is an interesting chapter in the history of this phenomenon though, and therefore I have decided to include an article about what happened and the Kings interest in RETROFUTURE 8. I feel that this needs to be highlighted again. So work has now begun on the next issue. Today I am happy to say that RETROFUTURE 7 has gone to the printers, so the plan for a release in May looks rock solid. As usual, I will print 1000 copies of which about 900 will be handed out for free (mostly in my neck of the woods, but some to the States as well). As stated before, this is the first issue of the final four, it will all end with RETROFUTURE 10 one day. The Montana Blue comic will be spread out over these final magazines, and this starts now. 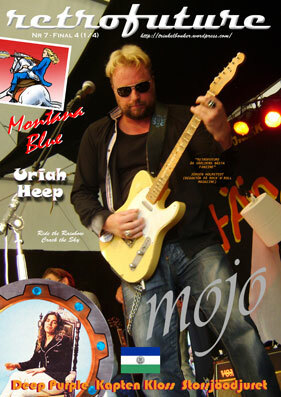 About 24 pages (of the 60) belongs to Montana Blue in this issue. The Deep Purple party I threw last year is also featured, seven pages in all (mostly in English) with plenty of pictures. 100 copies will be sent over to Johnnie Bolin for the Tommy Bolin festivities in Sioux City this summer. Friends of this blog will know the story (if this is news to you, just locate the “Deep Purple party 2013” category on this blog). It was a twin city kind of thing. So that will be fun. Pretty happy about this issue, it is exactly as eccentric as it should be. The interview with Michael “Mojo” Nilsson is a good one (his personal favourite as we speak, which is nice to hear), and I like the cover shot. The last session I ever had with the old Sony DSC-S750 (digital) camera. Anyhow, the countdown is on. Today I will pay homage to a Swedish journalist named Torsten Ehrenmark, whom in my opinion, was the best that we ever had. Born in Sweden in 1919, he died in London in 1985 while still working out in the field. He would travel the world to report on the events of the day. An entire generation of journalists looked up to the man, and for good reason. 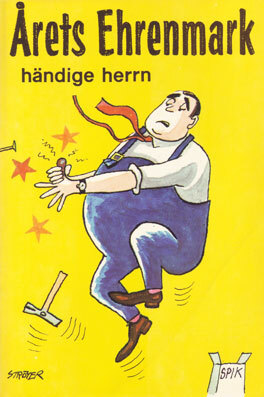 Between 1966 and 1985 he published his own annual book, called Årets Ehrenmark (The Ehrenmark Annual). In this he let his humorous side out and each book would contain several short chapters about his life. It was often memories of mishaps and awkward moments. As a reader you would just roar with laughter as he took you to London, Paris and New York. A quick example (from memory, I read this years ago and it stuck). Ehrenmark arrives in England on short notice and an important sports event is about to take place. His wife is on the way and he is in a real hurry to rent an apartment. He finds a place, looks it over, takes it, and hurries out to do his job. When he gets home to the newly rented place he finds out that it has no kitchen. His wife is not amused. The end. Now, a story like that is funny in itself, but he had a way with words that enhanced the reading experience greatly. When he was done telling it, your spirit would be lifted. Reading Ehrenmark was good for the soul. He was so great at his craft nobody else got even close. A cartoonist called Poul Ströyer worked with him, quite a team. I have collected Ehrenmark for years, I think I have most of his books by now but I still keep an eye open (they published books well after his passing). The 1966-1985 run is the stuff you need though. I salute the legacy of Mr Ehrenmark.